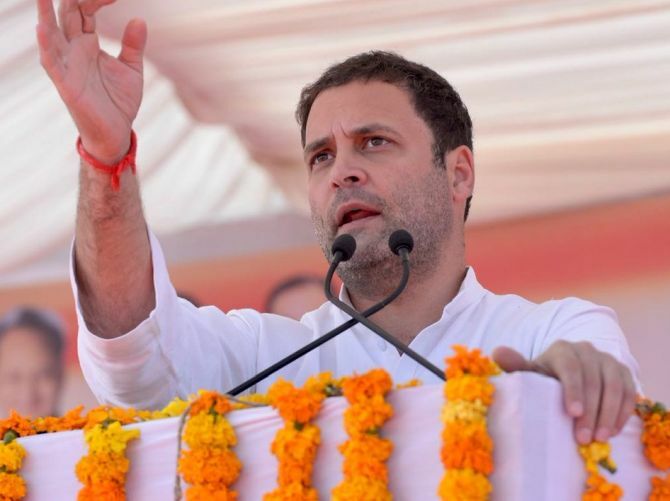 Tharad/Savli (Guj), Dec 12: President-elect of the Congress Rahul Gandhi today took a swipe at Prime Minister Narendra Modi for talking about Pakistan, China, Afghanistan and Japan in the Gujarat elections but avoiding speaking about his home state. Gandhi also questioned Modi's 'silence' on the company promoted by BJP president Amit Shah's son Jay Shah whose turnover was claimed to have shot up manifold after the BJP came to power at the Centre. Gandhi, who was declared elected as Congress president today, said Modi was frequently shifting his campaign plank in Gujarat. He said, first it was the Narmada water, but after farmers started saying it has not reached their fields, Modi changed tack and began speaking about OBC issues. When that also did not find favour with people, he went for development issues "but people punctured it", he said. "Now, Modiji speaks about Afghanistan, China, Pakistan, and Japan. Modiji, this is the election about the future of Gujarat. Please say something about Gujarat also," he told a well-attended rally in Tharad in Banaskantha district. Gandhi was apparently targeting the prime minister over his yesterday's suggestion that Pakistan was trying to influence the Gujarat Assembly polls and that some current and former officials of that country had met at Congress leader Mani Shankar Aiyar's residence a day before Aiyar's 'neech' remark against him. The Congress leader said, in the last couple of days, the prime minister devoted half his speech to Congress-bashing. "On one hand he is claiming that he has finished the Congress party in India, and on the other, he devotes half of his time to Congress. The other half of his speech is devoted to Narendra Modiji himself," the 47-year-old leader said. "Modiji please devote two-three minutes of your speech to (talking about) the future of Gujarat," he said. He questioned Modi's silence on corruption, as he targeted him over the alleged exponential rise in the turnover of a company owned by Amit Shah's son. "You listen to his entire speech, corruption is totally missing from it. Jay Amit Shah's company converted Rs 50,000 to Rs 80 crore in three months but the chowkidar is silent, not a word is coming out of his mouth." "Narendra Modiji fears Amit Shah, that is the reason he is not saying a word about Jay Shah," he claimed. Gandhi reaffirmed his promise that the Congress, if voted to power in Gujarat, will waive farm loans within 10 days. He claimed the NDA government waived Rs 1.30 lakh crore loans of 10 richest people in the country. He said when farmers also ask for a loan waiver, Union finance minister Arun Jaitley and the prime minister say it is not their policy. "Why the loans of farmers are not waived," Gandhi asked, and in the next breath gave the reply "as they do not fly in planes, they do not have big cars, and they do not have suit worth Rs 15 lakh." Gandhi again alleged there was corruption in the Nano deal between the Gujarat government and the Tatas. "The Congress allocated Rs 35,000 crore to MNREGA, while the BJP government gave Rs 33,000 crore to the Tata Nano factory. The water from Narmada went to that factory. The factory gets electricity for 24 hours even when you get it only at night," he alleged. The Congress leader claimed land in villages in and around Mundra were given to the Adani group at the rate of Re 1 per square metre, which the latter sold back to the government at Rs 3,000 for every square metre. Assailing the government over demonetisation and the GST, he said half the money of common people was "looted" by the note ban and the rest by the "Gabbar Singh Tax". Addressing a rally in Savli town in Vadodara district, Gandhi also attacked the prime minister on Rafale fighter jet deal. He said the Congress wanted to bring petrol and diesel under the purview of GST to "prevent excessive profiteering," but the PM refused to accept the demand "because he wanted to benefit his friends who own oil refining companies". Asking Modi to simplify the GST and shun "rhetoric", Gandhi said the time has come to "correct the 'one nation- seven tax' regime, which gives draconian powers to taxmen". He said the Central government should support the SME and the informal sectors to create jobs and "not unleash taxmen on them". Gandhi said the textiles sector, which is the second biggest generator of jobs, is "yearning for correcting the distorted GST structure". "Water is not available for irrigation in Gujarat...OBCs are also angry with the BJP. The saffron party's claim that Gujarat is a model state has failed to convince the common people," he said. Referring to Rafale fighter jet deal, Gandhi said, "Modi went to France for signing this deal to benefit his industrialist friend having a huge debt of Rs 45,000 crores on his head. This industrialist does not know anything about war. aircraft and has no experience in making fighter planes.